Fiercely funny and entirely original, this debut collection of stories takes readers from the United States to Israeland backto examine the mystifying reaches of our own minds and hearts. The characters of The Worlds We Think We Know are swept up by forces beyond their control: war, adulthood, familyand their own emotions, as powerful as the sandstorm that gusts through these stories. In Ohio, a college student cruelly enlists the help of the boy who loves her to attract the attention of her own crush. In Israel, a young American woman visits an uncommunicative Holocaust survivor and falls in love with a soldier. And from an unnamed Eastern European country, a woman haunts the husband who left her behind for a new life in New York City. The Worlds We Think We Know is a dazzling debutclear-eyed, hilarious, and heartbreaking. 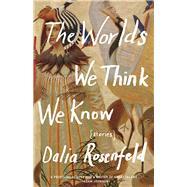 Dalia Rosenfeld is a graduate of the Iowa Writers’ Workshop. Her work has appeared in publications including the Atlantic, AGNI, Michigan Quarterly Review, Mississippi Review, and Colorado Review. She teaches creative writing at Bar Ilan University and lives with her three children in Tel Aviv.